Where I live, on Capitol Hill, new condos are going in daily—and with them, a new and growing population of DC residents. All that population influx has city planners in a tizzy. 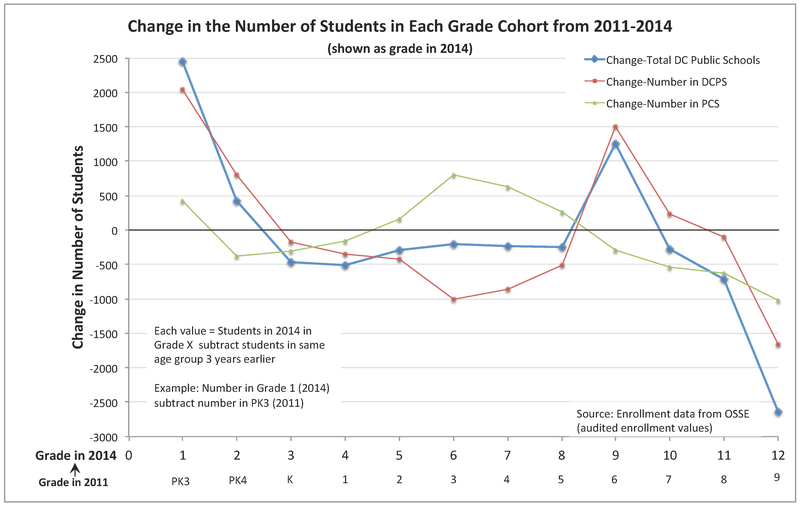 So: Are DC students growing at the same rate? Despite growth overall in DC’s population in that decade, the only groups of children that grew in numbers were babies, 1 year-olds, and 2-year-olds. The growth for each group was 10%; 7%; and 3%, respectively. All other groups of DC children declined in numbers over that decade, despite overall growth in population. And for all child age groups, growth slowed, and declines grew, as the children aged. Of course, no one chart can predict the future. 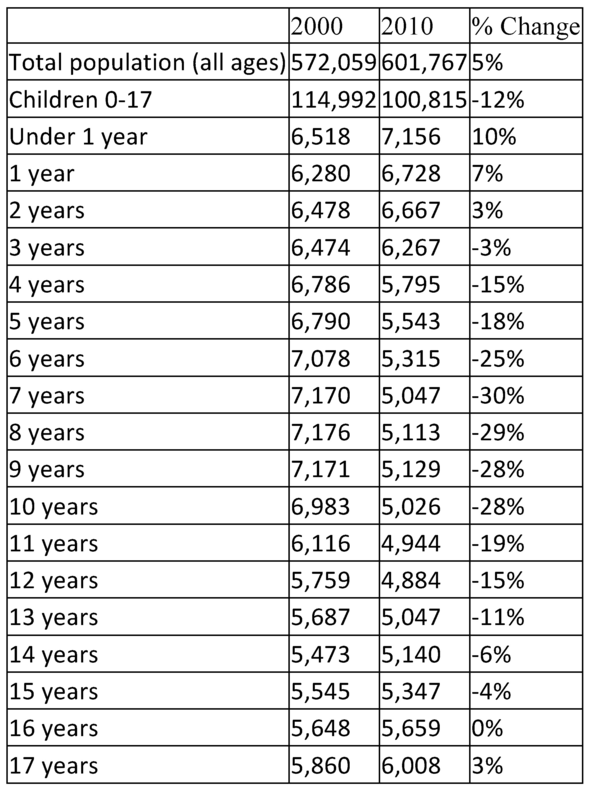 In fact, one could argue that based on the trend shown—lots of young children—the need for seats in DC public schools will only increase over time. Over that same recent decade, nearly half the age groups of DC kids show declines between 16% and 25%. Such a decline in the number of DC children is nothing new historically. Between 1960 and 2000, according to census data, DC’s population declined dramatically—children most of all. In 1960, DC’s 243,054 children were 31% of its population. 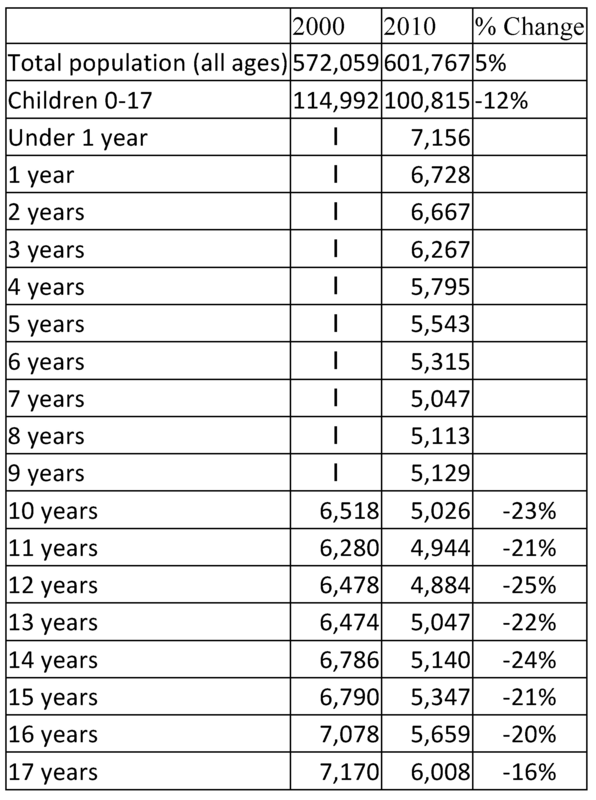 By 2010, even with DC’s overall population on the rise, our city’s 102,292 children represented a decline of 12% since 2000–and constituted only 17% of the total population. As it is, the total number of DC kids in 2010 was less than half the number of DC kids in 1960. This is not, of course, the dramatic overall DC population decline that began in the 1950s. Nonetheless, it reflects a student population decline that all DC public schools–both charters and DCPS–must deal with and plan for if they are to use their public resources wisely. So: What does all this mean for the future? Both the charter school board and DCPS have taken as a given that growth of DC public schools is imperative. Even after the most recent wave of closures of schools for underenrollment, for instance, DCPS opened some new schools and has plans for yet more. The charter board has resisted calls to coordinate openings of new charter schools, arguing that competition means better schools. As the NRC report on mayoral control of schools detailed, 102 charters have been granted in DC, with 38 since closed and 8 never opened, making for a charter closure rate approaching 40%. More recently, a report from the Progressive Policy Institute notes that a third of all charters have closed over the last 18 years, making a closure rate of 33%. Amid this high rate of closures is a high rate of new school creation. For instance, in 1999-2000, DC had 185 public schools serving 74,800 students. In 2014-15, DC had 223 public schools serving 85,400 students (data from the 21st Century School Fund). Thus, over a decade and a half, with a gain of 10,600 public school students (14% growth), we have 38 more public schools (20% growth). Somewhere in that differential–14% versus 20%–is the real cost of school closures and openings. Both require immense resources–whether siting a new school, renovating a school building, or ensuring other schools can handle students from closed schools. Not to mention the effect on communities. Perhaps the most hidden cost of uncoordinated school openings is what happens when there are just not enough students to go to all those new schools. One can hope that the deputy mayor for education’s task force will take that question square on, even if the DME herself cannot compel participation by those who oversee nearly half of DC’s public education students. Very interesting, Suzanne. I will link to you on my blog (gfbrandenburg.wordpress.com) – I often look at this type of data myself.